You live in a world where this song exists. 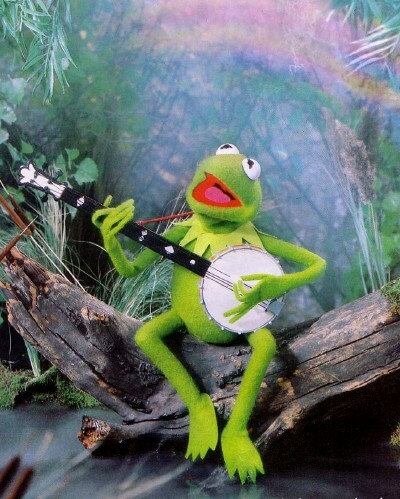 And it is sung by a frog puppet, playing a banjo, in solitude, surrounded by nature. It is a song that tackles the grand mysteries of the universe. A song that acknowledges that science and faith can provide a few answers, but we are still left wondering. A song that simplifies the questions that plague our species. "What's so amazing that keeps us stargazing?" In writing the music for the first Muppet movie, composers Paul Williams and Kenny Ascher knew that they had to open with a character-defining moment. A song that sets the tone for the movie and explains what Kermit the Frog is all about. What resulted is a deeply moving and philosophical piece that seems too important for the context. That is not to say it is out of place for the film. It is just astounding that after millions of years, the earth produced this moment. It is a song that motivates as well as contemplates. It reminds us that we may never know the meaning behind life, but we can continue to dream and live. We all feel it at some point in our lives. That magical sense that the world is too complex for us to fully comprehend. Like babies, we continue to be amazed by common occurrences. Inherently, rainbows are nothing special, just refracted light waves. But by being human, we apply significance to them. Doesn't that in itself make them special? When you listen to this song, try to forget everything life has taught you. Close your eyes and open your mind to every possibility, every idea. Very nice little article on the connection. The rainbow connection is something that is the core of my thinking, and something that I believe in very strongly, and I believe you captured much of it perfectly in this small post. Well said. We should be wondering what keeps us stargazing, why does that matter to us, what is important about it. We can't define it, but it does seem inherently important. The song speaks to essence. It says something fundamental about our humanity, and that is what gives it beauty. A much deeper level indeed.. I heard this song many times. Nice tune, I thought. Then I heard it on TV in The Muppet Movie. I started crying uncontrollably. I knew that I had found that Rainbow Connection at the cat rescue shelter where I volunteer. A magical, out of body experience. Transcendent. God. Janice I think you are very right. Transcendent. I want to think of it in a Buddhist light. The Buddha reminds us that all is one, though outwardly we look and seem so different- so separate. That's the nature of light... broken up into parts (colors) that we see. But really light is all those colors coming together as one. =) Only when all the colors are together are we able to see anything (with light!). In Norse, Greek, and Hawaiian mythologies the rainbow Co mention meant a connection to god(s). In Christianity it is a sign of God's promise. Just something to think about as well. The First Mate is an Overacting Ham! The Captain is a Chauvinistic Pig! Uh Oh... Zoot Skipped a Groove Again. Today's Post is Brought to You by the Number 10! Copyright © 2011. This is a fan work and is not sponsored by the Jim Henson Company. Picture Window theme. Powered by Blogger.